The ocean is the home for a lot of animal species and ocean themed crafts are a popular choice for children too. They have so much too choose from such as dolphins, fishes, jellyfishes, manatees, octopuses, otters, sharks, squids, starfishes and whales. Children can make an ocean scene diorama from a shoe box and other craft materials such as pipe cleaners, old cereal boxes, crayons or markers and whatever craft materials you can find. For the ocean animals you can use small plastic ocean animal toys. Another craft idea is a jellyfish made from construction paper and crepe paper and decorate it with glitter, paint and stickers. You can also make a jellyfish from a paper bowl and crepe paper. Both jellyfishes can be hung with a piece of string. You can make a starfish from a paper plate too. All you need to do is draw a starfish on the paper plate, cut it out and paint the starfish with acrylic or watercolor paint. Toddlers and preschoolers can make a sparkly fish from a lunch paper bag stuffed with newspaper and tied with a pipe cleaner, wire or rubber band right above the stuffing to form the body and the tail. Draw on the mouth and eyes using a marker. 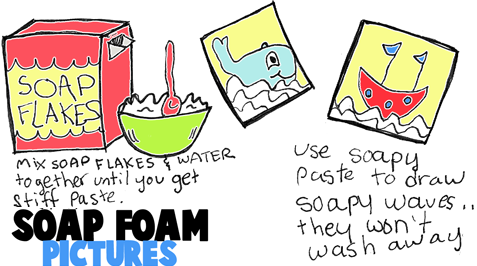 Learn how to make a soapy foam paste that will be used to make a great water scene. Firstly draw the part of the picture that won't have the pasty foam...such as the fish, whales, sharks, boats, reefs, or whatever. Then to make the foamy paste, have your parents help you mix soap flakes and water together in a bowl until a thick and stiff paste is created. Then use a paintbrush or your fingers to paint the pasty foam onto the paper. When the foam dries, it will continue to have the 3-dimensional qualities that they had when you painted them.